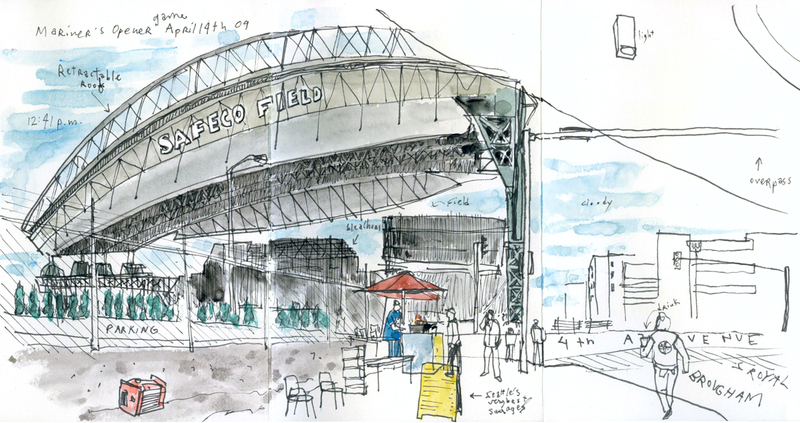 This afternoon I stopped by Safeco Field to check out the scene before the doors opened. I had other things to do in the newsroom but enough time to do a quick sketch. It was three hours before the game and people were already getting there. A food stand with “Seattle’s very best sausages” was already up and running. The owner of the food stand was wearing a shirt with the number 8, for Hasselbeck. I had to google that to realize Hasselbeck is actually a Seahawks player. So much to learn about football and baseball. I can tell you who the Sounders’ Montero is though! Anyway, I leaned against one of the pillars supporting the overpass and sketched away as people passed by. You won’t believe that I’ve never been to a major league baseball game. I only saw the Everett Aquasox once. All the happy looking folks heading to Safeco field made me want to learn more about this sport. We actually have tickets to see them play against the Oakland Athletics on May 3rd. That’ll be my initiation to baseball. It’s about time, considering I’ve lived in the U.S. for 11 years now and my son just started T-ball. I better learn fast. I don’t want to be a clueless dad when I go watch him play. Note: You have to register to leave comments, it only takes a minute so do it now before you forget! Once you log in one time you won’t have to do it again unless you erase cookies on your browser.